All organizations worth their salt use them. Not only are they decorative, they are a necessity. They are the ‘face’ of an organization. We look out for them when we are searching for a firm’s location. They help us identify different firms located in the same building or area. Without a shadow of doubt, office signs are important in any firm. There are many types of signage. However, the best are those that are visible, last long, are easy to install and are cost effective. At WiseDecor, we have vinyl lettering that meets all these requirements. You can apply them in a number of places: as long as the surface is flat or on a wall. Ideal sign locations for many firms are inside and outside the office. Outside, our vinyl letters will look great in areas such as notice boards. 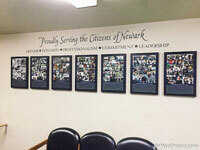 Inside the office building, they look wonderful around photo walls, reception area, corridors and offices. It takes only a few minutes to put them up. WiseDecor signs are suitable for all types of organizations. We have vinyl letters for the following categories: church, health facilities, police and the non-profit and volunteer organizations! We have something for everyone. Our quotes are also motivational and are suitable for the office environment. They boost employee morale while inspiring visitors at the same time. We also have an excellent rewards program that will go a long way in cutting costs on future orders. 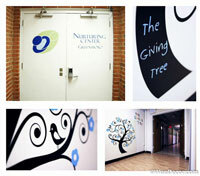 Get in touch with us if you are looking for unique and decorative vinyl lettering ideas. They are a great way of making your mission known to your clients and community. We look forward to hearing from you! I just unveiled the decal to our managers yesterday at their weekly meeting. It turned out great! 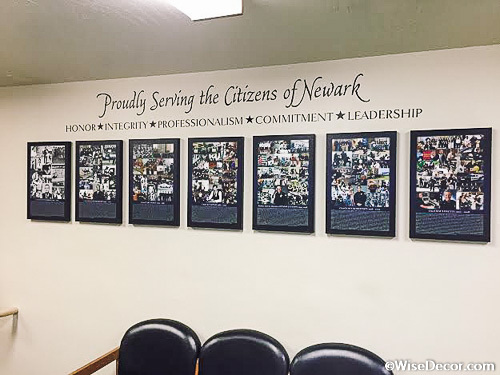 The decal is up in our police department lobby above our historical collages. The wording conveys what our department is about and how it works in partnership with our community... to emphasize our commitment to our mission, vision, and values...Thanks again for your assistance (and persistence)! I just wanted to thank you and the ladies at Wise Decor again for the beautiful signage and 'giving tree' we are able to display here at agency. Your willingness and helpfulness through the process, of making decisions and presenting us with an awesome final result will go a long way for us as work serve our clients with some color and visual interest. Thank you again and we definitely know where to find you in the future. I just put up the lettering and it’s awesome! Thank you so much! These are all in a school Media Center. 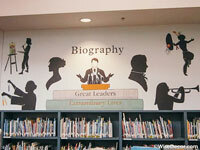 The big ones are used as motivational quotes in the library – and yes, the kids do read them and love them. 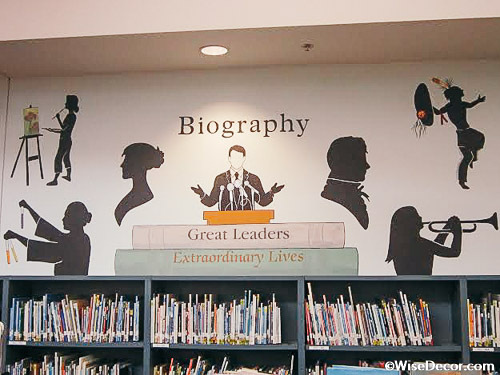 The Great Leaders and Extraordinary Lives were ordered to complete a mural – much cheaper than having the artist letter the book titles by hand.